Winter’s heavy snow and ice, as well as frozen soil conditions, can be highly stressful on cherished trees and shrubs in our suburban landscapes. Even areas without major snowfall experience high winds and huge fluctuations in temperatures during winter. The excessive weight of ice or snow can cause tree branches to snap. Proper pruning encourages the formation of the strongest possible branches and branch attachments. Properly installed cables and rigid braces add support to a weakened part of the tree. Even evergreens lose moisture from their needles from winter winds and some deciduous trees suffer from winter drying. If water isn’t available, as moisture is drawn from living cells, permanent damage will result. On bright, sunny winter days, the tree’s trunk and main limbs can warm to 15 degrees higher than the air temperature. But, as soon as the sun’s rays stop reaching the stem, its temperature plummets, causing injury or permanent damage to the bark. The two main types of injury are known as sun scald and frost cracking. The effects of sun scald and frost cracking can be reduced by sound arboricultural practices to maintain overall health. Preventive maintenance can lessen the adverse effects of winter weather on your trees and shrubs and alleviate much tree damage. Aeration around trees helps improve water and air movement in the soil. This strengthens the tree’s root system and reduces soil compaction. 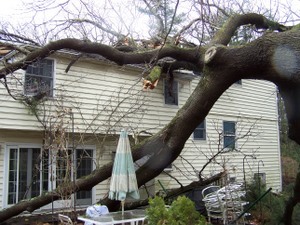 In case of moderate storm damage, restoring the tree to its former health and beauty may take some time, but it generally can make a full recovery. Broken, hazardous limbs should be removed immediately. Pruning to remove broken stubs and restore the balance of the crown can be put off a while, but shouldn’t be delayed more than one growing season.